1.5 oz bag baked snack crackers made with 100% real cheese. Single serving 1.5 oz bag of baked snack crackers. made with 100% real cheese. 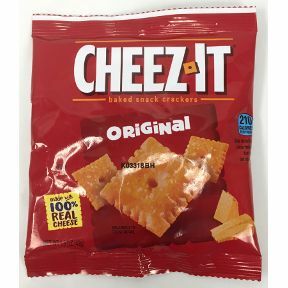 ingredients: enriched flour (wheat flour, niacin, reduced iron, vitamin b1 [thiamin mononitrate ], vitamin b2 [riboflavin], folic acid), vegetable oil (soybean and palm oil with tbhq for freshness), cheese made with skim milk (skim milk, whey protein, cheese cultures, salt, enzymes, annatto extract for color) contains 2% or less of: salt, paprika, yeast, paprika extract color, soy lecithin. contains wheat, milk and soy ingredients.